African exports to China fell by almost 40% in 2015, China’s customs office says. China is Africa’s biggest single trading partner and its demand for African commodities has fuelled the continent’s recent economic growth. The decline in exports reflects the recent slowdown in China’s economy. This has, in turn, put African economies under pressure and in part accounts for the falling value of many African currencies. Presenting China’s trade figures for last year, customs spokesman Huang Songping told journalists that African exports to China totalled $67bn (£46.3bn), which was 38% down on the figure for 2014. BBC Africa Business Report editor Matthew Davies says that as China’s economy heads for what many analysts say will be a hard landing, its need for African oil, metals and minerals has fallen rapidly, taking commodity prices lower. There is also less money coming from China to Africa, with direct investment from China into the continent falling by 40% in the first six months of 2015, he says. Meanwhile, Africa’s demand for Chinese goods is rising. In 2015 China sent $102bn worth of goods to the continent, an increase of 3.6%. 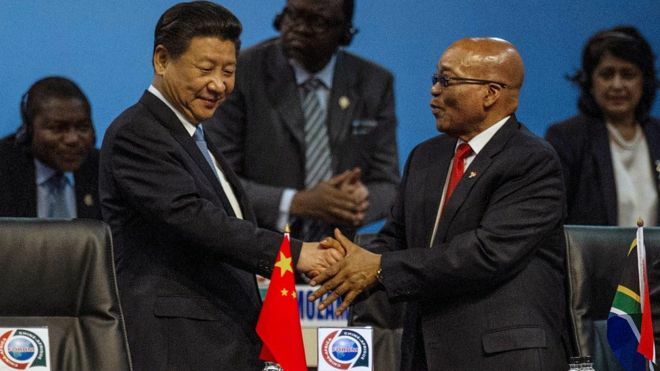 Last year, South Africa hosted a China-Africa summit during which President Xi Jinping announced $60bn of aid and loans, symbolising the country’s growing role on the continent.